“On this day in 1965 at 5:16 in the evening, an error made days earlier by energy personnel disrupted the electricity supply of much of Northeast US and Canada, leaving more than 30 million people over 129,000 square kilometres without electricity for up to 12 hours. The root of the blackout occurred several days earlier, when maintenance personnel set a safety relay to trip if the current exceeded the capacity of the transmission line–but they accidentally set it too low. November 9 was a typically cold late autumn evening in the northeast, with power for heating, lighting, and cooking pushing the electrical system to near its peak capacity and loading the improperly set transmission lines. At 5:16 PM, a surge of power from a Lewiston, New York, plant tripped the misset relay in a Niagara, Ontario, generating station, which caused several other heavily loaded lines to fail as well. This precipitated a surge of power that overwhelmed transmission lines in New York, bringing about a cascade of tripped lines across the Northeast US and Canada. 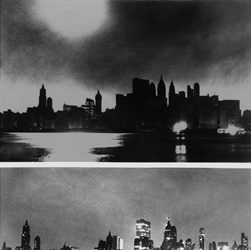 The Great Blackout of 1965 had blanketed the northeast. The power failures occurred at the height of rush hour, plunging large portions of eight US states and parts of eastern Canada into darkness, delaying millions of commuters, trapping some 800,000 people in New York subways, and stranding thousands more in office buildings, elevators, and trains. Across the northeast, theaters were closed for the evening, office workers took refuge in hotels, and New York’s Times Square, typically a mecca of light and activity, was trapped in darkness. All together, some 30 million people in eight states and two Canadian provinces were affected. Power was restored in many areas by midnight, but it took until almost 7 AM to restore power to all regions that lost it. The blackout spurred electrical engineers to reexamine the power grid system and measures were taken to avoid a similar accident in the future. Reliability councils were formed to create power standards, share information, develop new metering and monitoring equipment, as well as improve coordination between electricity providers. Caption: During and after photos of Manhattan’s skyline 9-10 November 1965.